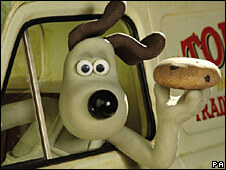 Cracking viewing figures, Gromit! Animated duo Wallace and Gromit have topped the Christmas Day TV ratings with their latest adventure. The 30-minute show, A Matter of Loaf and Death, attracted a peak audience of 14.4m - ahead of the concluding episode of an EastEnders double bill on 12.6m. The BBC secured an emphatic ratings victory with nine of the top 10 shows. Doctor Who, The Royle Family and the first episode of EastEnders completed the top five, based on peak figures. Coronation Street was ITV1's top-rated show, drawing a peak audience of 7.6m and maintaining an average of 7.4m throughout the one-hour special. This latter figure would see it placed ninth in the list of the day's most-viewed programmes. Rival soap Emmerdale pulled in a peak of 5.4m viewers, while the channel's other big draw was the Dancing on Ice Christmas special, which attracted a peak audience of 5.5m. Key: The first number is the peak viewing figure, measured at 15-minute intervals. The figure in brackets is the show's average audience. Short programmes tend to record high averages. These initial figures do not include viewers who recorded the programme to watch at a later date, meaning the actual audience figures will be higher when the final totals are released. 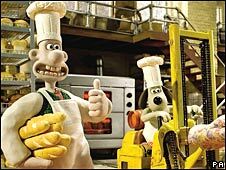 A Matter of Loaf and Death, screened at 2030 GMT, saw inventor Wallace and his dog Gromit open a bakery. Based on the average figures, it secured the biggest Christmas Day TV audience for five years. The pair, making their first appearance since 2005, enjoyed a festive double success as their last film The Curse of the Were-Rabbit - shown on BBC1 at 1630GMT - also made it into the Christmas Day top 10. EastEnders featured the return of "Nasty" Nick Cotton, as well as the storyline of Sean Slater discovering he is not the father of wife Roxy's daughter, Amy. The double bill was spread across the evening, with the first part at 2000 GMT and the concluding half-hour from 2100 GMT. As with last year, the Christmas specials of Doctor Who and Strictly Come Dancing were hits with viewers. Wallace and Gromit and Dr Who were tops for us. And returning comedy favourites The Royle Family and Blackadder also pulled in impressive ratings. BBC One controller Jay Hunt hailed the channel's "phenomenal performance". "I am delighted so many millions of viewers enjoyed BBC One's fantastic line up of family comedy, entertainment and drama," she said. "More than half of all people watching television tuned in to watch Wallace and Gromit's latest adventure."